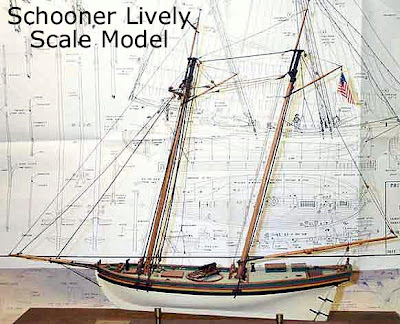 In 1821 the schooner Lively landed and thirty-eight men, who would be the first of Stephen F. Austin's many colonists, set foot on land that would soon become Velasco (Old Velasco, Surfside). At that time nothing other than one lonely house existed at this site, some 16 miles south of Angleton in Brazoria County. For ten years that single structure marked this spot as a port, then in 1831 the Mexican government enacted new laws. They had noticed a preponderance of wealthy, autocratic Anglos in the region and realized they would soon lose their hold on this very valuable province unless a strong stand was taken. These measures would attempt to halt Anglo immigration from the United States of the North, abolish slavery throughout Mexico (including Texas), establish tariffs and create customs houses at key entry ports. Mexican politicos felt this area would be useful as a port to aid in the movement of soldiers, welcoming new settlers and promoting the shipping and receiving of goods, so Velasco ( named after a Mexican General) was formerly established and soldiers were dispatched to watch over the port along with a customs collector. 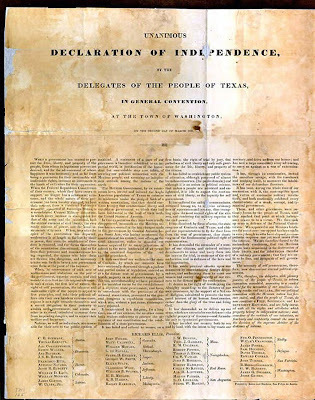 For years, the Texians had remained divided, some clamored for revolution and an independent Texas Republic, while others called for autonomy and possible statehood. Now, regardless of their stance, they were invigorated and reacted boldly. In June of 1832 at Brazoria, forty colonists organized a militia, commandeered a schooner, loaded it with a cannon, and headed down the Brazos River toward Velasco. Their initial intent was to attack the Mexican post at Anahuac (North of Galveston on Trinity Bay) but Colonel Domingo Ugartechea, in command of the garrison at Velasco and its one-hundred and twenty-five men, weapons and one cannon, refused them passage. 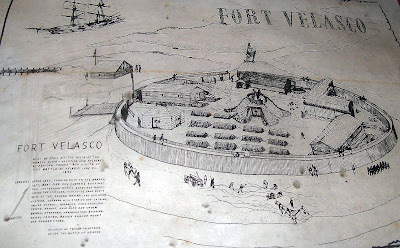 The Texians reorganized into companies under Captain John Austin and Henry Smith (first provincial governor of the Republic of Texas) and along with the fortified schooner commanded by Captain William Russell made plans to siege Fort Velasco if necessary. On the morning of June 25th, under the leadership of Captain John Austin, one hundred and twelve poorly armed farmers approached Fort Velasco by land and made formal demand for their surrender. In the event it became necessary, plans had already been drawn for Austin's company to attack from the north, while Smith circled between the fort and the shoreline and attacked from the driftwood piles. The schooner was to drift downriver, align themselves within cannon range along the bank and adjacent to the fort. Ugartechea refused surrender and fired 109 of 113 rounds from his main cannon, most over the heads of the attacking ground militia because the Mexicans had been aiming for the schooner. The Texians, who were sharpshooters, and now close to the fort set their sights and opened fire on the Mexican soldiers with deadly accuracy. In unison with the Texian land force, the schooner's crew began firing their cannons with positive results. The Mexican soldiers fled the safety of the fort and attempted to board the schooner but were driven back, not without losses. After an eleven hour battle the Mexican soldiers waved a white flag signaling surrender. They were running low on ammunition and had no hopes of reinforcements (the Mexican government had been occupied with an internal revolt) while Texans had been receiving both supplies and additional men. The Texans lost seven men and twenty-seven were wounded, the Mexicans lost thirty-five with fifteen wounded. One author states that the site at Old Velasco became the "Boston harbor of the Texas Revolution". Ugartechea surrendered with the Honors of War, his men retained their assigned arms and minimal ammunition. He and his men were removed and taken across the river to Quintana, where they awaited transport to Matomoras. 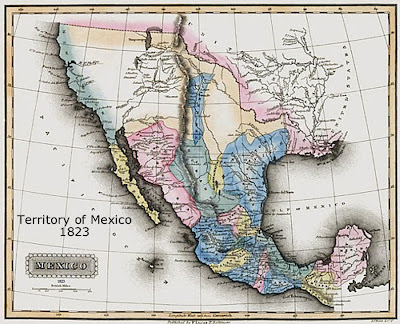 At this time the territory of Mexico looked like this. Within 4 years after Velasco was established, twenty-five thousand new settlers would enter the fledgling port and not far upstream her community would develop and thrive. By 1835 Velasco was growing and now home to a two trading posts, salt works and a customs house; however, during this period Old Velasco was not without her share of ups and downs. 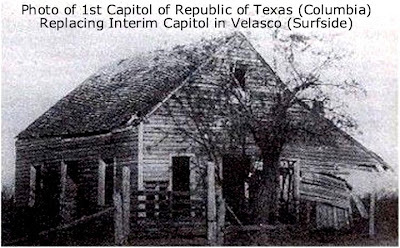 Along with becoming the site of the first Texan uprising in 1832, in 1834 Velasco's population was reduced to one hundred from a cholera epidemic but rebounded and a mail route was established from San Felipe to Velasco in 1835. 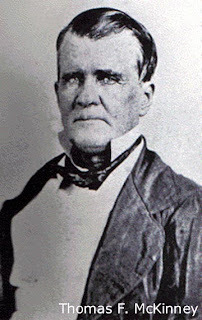 In 1836, after the Battle of San Jacinto, the first president of Texas, David G. Burnett designated Velasco as the temporary capital of The Republic of Texas. 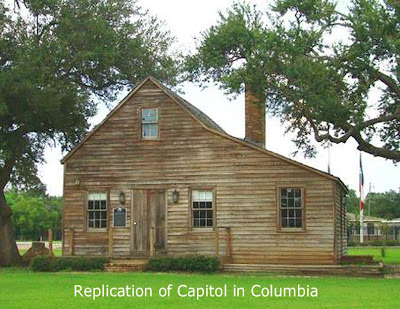 Government records were housed at Fort Velasco until the first official capital of Texas was established at Columbia later that same year. The Treaties of Velasco were signed at Fort Velasco on May 14, 1836 by Texas President Burnet and Antonio Lopez de Santa Anna of Mexico. The Treaties were intended, on the part of the Texans, to help provide a conclusion of hostilities between themselves and the Mexicans, and at the same time offer the first steps towards Mexico's public recognition of the burgeoning Republic's breakaway independence. 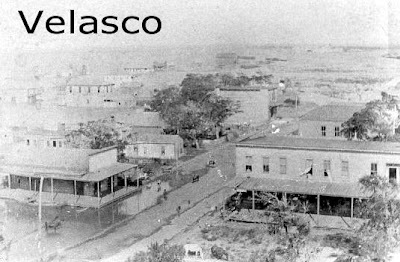 Between the Texas Revolution and the Civil War, Velasco served as summer resort for wealthy plantation families in the region. Galveston businessmen Samuel May Williams and Thomas F. McKinney established warehouses and organized shipping at the port. A seminary for young ladies, Velasco Female Academy, and a school for young men, taught by Oxford graduates, were established by 1838. Comfortable hotels were built to accommodate visitors to Velasco and patrons of the racetrack located a short distance upriver. In 1846 Velasco was assigned a post office that operated until 1891. During the civil war years 1861-1865, the port of Velasco was fortified by troops and eight gun batteries at the mouth of the Brazos River. They were to provide shelter and landing facilities for blockade runners, protect rich farmlands, and prevent Federal invasion. The South, for army and home use, exchanged cotton for European guns, ammunition, milled goods and medicines. Velasco was one of the busiest ports and Federal vessels attempted to stop vital trade by constantly fired upon runners as well as the shore defenses and patrols. The runners would approach the port on dark nights when the waters were smooth, and by the use of sounding lines could determine nearness to shore and avoid blockaders. Boilers would be kept well fired with hard coal that burned with a minimum of smoke, in case it became necessary to outrun Federal patrol ships. Union ships had to travel to New Orleans for drinking water, food and fuel, because Texas marines on rafts and dredgeboats or Texas cavalry and infantry units kept them off the shores. The raw courage of the Texas coastal defenders made this a most dramatic story in the history of the Confederacy. Antebellum Velasco had supported businesses, homes, a hotel, boarding houses, wharves, and a customs house. Riverboats had embarked from Velasco to Galveston and New Orleans but upon completion of the first intercoastal canal to Galveston Bay in 1856, shipping was diverted to Galveston and Velasco's demise began. Following the Civil War came the ruination of the plantation system and Velasco declined as a resort destination. In 1875 a hurricane destroyed the old town records and by 1884 her residents numbered only fifty. 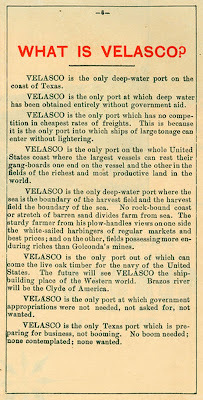 The only need Velasco had for shipping was livestock raised by the local farmers, the city was now reduced to semiweekly steamer service to Brazoria and reported only a general store and one boat builder's shop. In 1891 came the closing of the Velasco Post Office, local mail was rerouted through Quintana across the river. 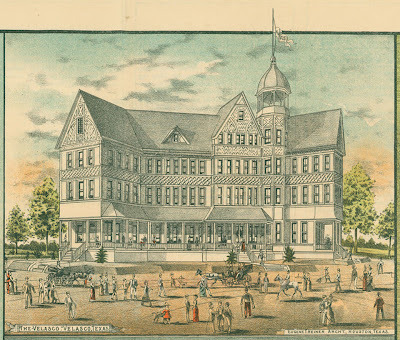 In 1891 the town was surveyed and laid out, the new Velasco was born and another post office was established. The port was officially opened by the United States Secretary of the Treasury on July 7, 1891. A year later over one-million dollars worth of property had been sold and promoters working throughout the Midwest were actively advertising the Velasco Hotel and surrounding areas. 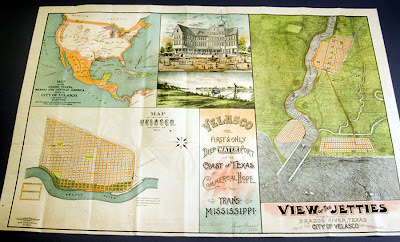 By 1892 Velasco had 136 business establishments and 167 residences, an electric light plant, and a planning mill. 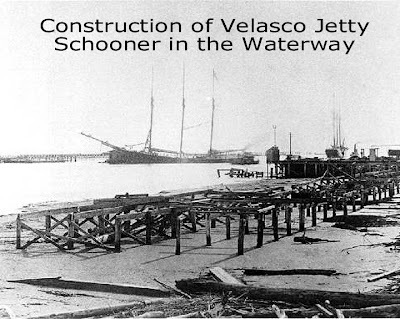 In 1897 the jetties were completed by the Brazos River Channel and Dock Company and the newly dug deepwater port ran to a depth of 17½ feet. 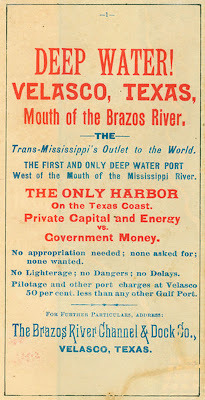 New settlers to Velasco traveled to Houston by train, to Columbia on the Columbia Tap branch of the International and Great Northern Railroad, and then down the Brazos by riverboat to Velasco. The Velasco Terminal Railway, completed around 1890, allowed passengers to proceed directly from the Columbia Tap connection at Anchor to the new town. According to some sources, much of Velasco, first owned by John A. and William H. Wharton, was later sold to an agent of the English Rothschild family, who planned to establish a great seaport at the site. By 1896 the community had a new lighthouse. 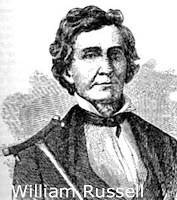 Velasco had several churches, schools, hotels, a national bank, a cottonseed oil mill, cotton gins, special and general stores, and two weekly newspapers, the Times and the World. At this point Velasco was shipping cottonseed oil, cotton, lumber, and livestock. 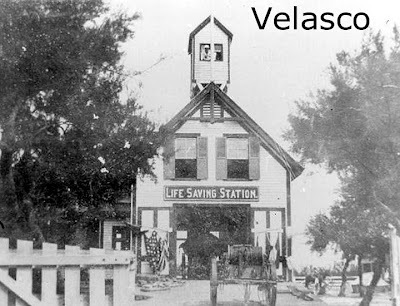 By 1900, Velasco could be reached by electric railroad and her population was three thousand (3,000); unfortunately, the areas worst disaster was yet to unfold, in September of 1900 a fierce storm would pass through the town leaving devestation in its wake. Velasco was slow to rebuild, enduring fluctuations of poverty and prosperity. By 1914 her population was 1,000 with one newspaper, the community had still not rebounded, the businesses remaining in Velasco were a fish and oyster plant. Not much but cattle, cotton, cane sugar, and syrup were being shipped from her ports. The population dropped to a low of 400 in the mid-1930s. 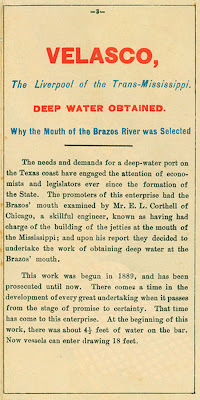 A diversion of the Brazos River and the formation of a tidal estuary deep enough to accommodate large vessels in the old river channel subsequently revived both Velasco and nearby Freeport. Construction of chemical-industry facilities during World War II increased the population of the area from 900 in 1940 to 5,200 in 1950. With an independent population estimated at 4,000 in 1956, Velasco was incorporated with Freeport on July 27, 1957. 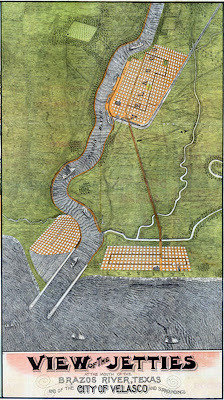 The older site of Velasco, the southeastern portion, was platted over and the site of Old Velasco, including the location of the fort, became Surfside, TX. The people who know and love her best, her strengths and weaknesses have called her by many names, Old Velasco, Surfside, Surfside Beach and the Village of Surfside. 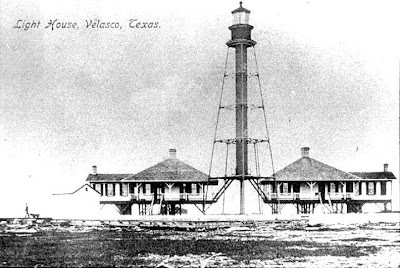 Today, Old Velasco (Surfside) is still growing, her historical significance in the annals of Texas history are immense as well as the delights she holds for her residents, those who vacation there and those yet to visit her welcoming shores. Surfsidians and all Texans should be proud of the historical significance of this seaport village. 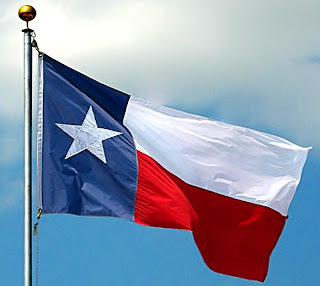 If not for the strong desire of Stephen F. Austin's settlers to this area in becoming an independent republic, the face of our great state could possibly have a different look. The first bloodshed and defiant act of Texians at the skirmish of Fort Velasco in 1832 was the impetus for all battles that followed, ending with Santa Anna's defeat at San Jacinto in 1836. For nine years following that battle, Texas governed itself as an independent country and that's a fact. In my estimation and many historians, if not for the militia that formed to takeover Fort Velasco, what you see below may have had a much different timeline. 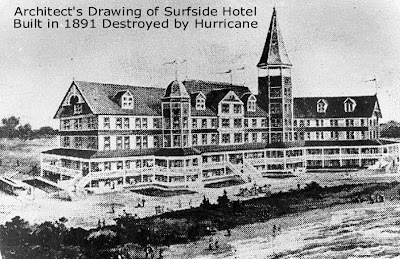 It would be irresponsible to not mention some history of the peoples who populated the land we now call Surfside prior to the coming of Stephen F. Austin's settlers.. In 1528, Spanish explorers became shipwrecked on a small island west of Galveston. One of the survivors of the Panfilo de Narvaez expedition was Alvar Nunez Cabeza de Vaca. Historical records of the people who lived in this area began that year, they were a band of nomadic hunters who called themselves "Karankawa". 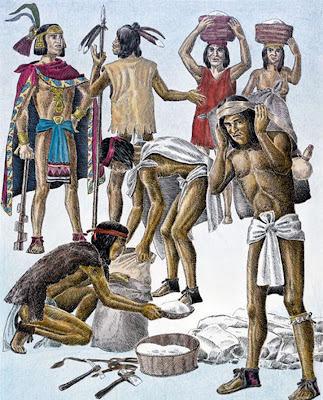 Cabeza de Vaca lived among these native people for several years, and much of what we know about the Karankawas is derived from his written accounts. The Karankawa were a group of native Americans who resided along the Texas Gulf Coast from Galveston Bay to Corpus Christi Bay. Though they shared a common language and way of life, there were actually three distinct tribes of Karankawa Indians — the Coaques, the Copanes and the Carancaquacas. Archaeological evidence shows that the Karankawas were nomadic hunter-gatherers who lived in round thatch huts or wigwams. They traveled in bands of 30 to 40 people led by a chief, and their principle mode of transportation was the dugout canoe. During the winter, the Karankawas would set up camps around the coastal bays. They subsisted on fish, shellfish and turtles. In warmer months, the tribes would move inland to hunt deer and bison and to gather berries, nuts and roots. Karankawa men were expert hunters and fisherman. The Karankawas crafted pottery, baskets and weapons, including the long bow. The bow and arrow was their primary weapon for hunting and warfare. Karankawa men were reported to have been unusually tall and heavily tattooed. They pierced various parts of their faces and bodies. Karankawa women also tattooed their skin and wore body paint. 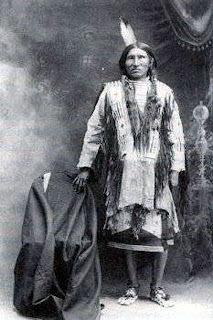 Their clothing was fashioned from animal skins or moss. In 1685, Rene Robert Cavalier, Sieur de la Salle, led a French expedition along the Texas Coast. Near Matagorda Bay, he established a colony for France and named it Fort St. Louis. Soon after, the Karankawas attacked the settlers, killing all but several children whom they took captive. These children were later rescued by Spanish explorers in the early 1690s, and their accounts of life among the Karankawas provide a great deal of insight into the customs and culture of these people. France and Spain continued sending explorers along the Texas Coast, and by the early 18th century, the Spanish had organized a number of missions to Christianize the native tribes and to make them loyal subjects. The missionary system created hostility between Spaniards and Indians and conflicts often erupted. By the early 1800s, however, epidemic diseases introduced by the Europeans had greatly reduced the population of natives in the New World. 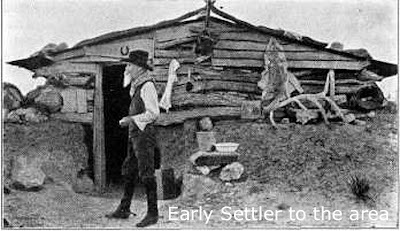 The Karankawas also suffered from settlers invading their lands and competing for resources. The Karankawas in Galveston faced a detrimental blow after a confrontation with Jean Laffite’s commune at Campeche in 1819. After Laffite’s men kidnapped a young Karankawa woman, 300 warriors from her tribe attacked the privateer’s fort. Laffite was far outnumbered by the Karankawas warriors but the commune was armed with two cannons. The bows and arrows of the Karankawas were no match for their deadly arsenal. After Mexico gained independence from Spain in 1821, Anglo-Americans were encouraged to immigrate to Texas, then a sparsely populated province. Colonists were frequently attacked by the Karankawas, and efforts were made to “exterminate” the natives. During the 1840s, only a few scattered tribes of Karankawa Indians remained along the Texas coast. Disease, colonization and genocidal warfare proved to be a lethal combination. Sadly, by 1858, the Karankawas were considered an extinct group of people. If you wish to learn more about Surfside and her people, or you would like to plan a vaction to this wonderfully charming seaside resort, please CLICK HERE. If you travel to Surfside, take time to visit the historical museum in the City Hall, which is the old Coast Guard station house.